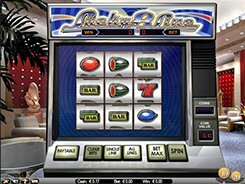 Lucky 8 Line is a classic video slot played over 3 reels and 8 paylines. The symbol set incorporates classic cherries, bars, oranges, plums, watermelons and sevens. The control buttons below the reels are a bit unusual in the way they work, yet they are very easy to understand. A coin value has two options: $0.1 and $0.2, with up to 8 coins per each line, therefore the maximum bet is as low as $12.80 per spin. 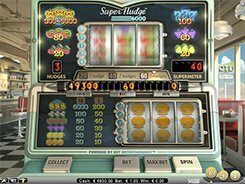 All winning combinations that you may hit in the slot can be conveniently classified into three groups: three-symbol combos, nine-symbol combos and special combos. Hitting three matching symbols across an active payline awards up to x200 times a bet. If you get all the reels covered with nine matching symbols, you win up to x500 times a bet. 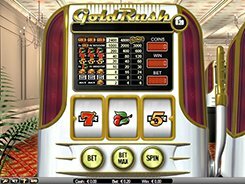 As for special combos mentioned above, they are formed by rolling up two or more 7s on the reels, with the largest cash prize of x1000 times a line bet (up to $1600) paid out for getting nine 7s on the reels. PLAY FOR REAL MONEY!